Smaller examples Buddhist Cave art of the Monumental Wei Dynasty buddhist statues of Yungang near Datong in Shanxi, still colorful after 1800 years. Other Wei Dynasty caves, evidence of the penetration of buddhism on the silk road, are found at LuoYang in Henan, Lanzhou in Gansu and other places. Map 1 of the Silk Road during the early Tang Dynasty Era. Clearly depicts the North & South Routes West of Dunhuang as well as the lost civilizations of Loulan and Hotan. AD 618-907: The Silk Road of the Tang Dynasty. T‍‍he Sui Dynasty falls to multiple rebellions leading to the emergence‍‍ of the Tang Dynasty which will build on its legacy. 3rd Century AD‍‍: At some time in the first decades of the third century AD‍‍ activity starts at the silk road Buddhist Relic Site of Kizil (also Kyzyl) near Kuqu (also Kucha ; or Kuçar, Kuchar; Uyghur: كۇچار , Куча ;Chinese: 龟兹), today a location underneath the Tianshan (Heavenly) Mountains in Aksu Prefecture of Xinjiang-Uighur Autonomous Region of the Peoples Republic of China. It is the beginning of the the Kyzyl Buddhist Caves (克孜尔千佛洞), the early works of which are commonly associated with the Buddhist Kingdom of Kucha of the now mostly lost Tocharian Civilization. After having been rediscovered and visited in the early 20th century, the Kizil Caves will become known as the (probably) oldest surviving examples of Buddhist Cave Art anywhere along the ancient silk road in modern day China. The Kizil Caves are held to be contemporary with the (destroyed) oldest known Buddhist Cave site at Bamiyan in‍‍‍ Bamiyan Province in northern Afghanistan. , Lop Nor , Loulan and Khotan , to Kashgar in Central Asia and, via what today is the pathway of the Karakoram Highway, on to India. The goal behind the mission was simple: to acquire better knowledge of Buddhism than was available at that Time within China . The Monk hoped to bring back the teachings of the Buddha where possible in the form of scrolls and scriptures. In his later published accounts of his travels Fa Hsien describes Khotan City , Kucha and Turpan (Turfan) , Khotan (Yutien) , the Taklamakan Desert, Taxkorgan - the ethnic home of the Kazakhs , and in general the daily Life and Culture of the various peoples and regions he traveled through on his way to India. Although the travel accounts of Fa Hsien are not always sufficient to pinpoint exact locations, nor his exact route of travel, his account does provide interesting information on the conditions of travel and the Buddhist sites and practices he witnessed. Interested as he was in the practice of Buddhism and its exact theology Fa Hsien clearly indicates the importance of the seven precious substances in Buddhist worship, the widespread practice of stupa veneration, and his acquaintance with several of the jataka tales about the previous lives of the Buddha Sakyamuni, tales which are illustrated in the paintings at the Mogao Caves just outside of Dunhuang in Gansu Province . 5th-6th century AD: Silk Road traffic increases along with Buddhist influence, with 2 million Buddhists in China by 514 AD. The Gandharan Kingdom extinguished by Hephtalite (White Hun) invasions. By 430 A.D. the invasion by the Huns has established a large but shortlived territory in eastern Europe. 432 AD: Nestorians outlawed in Europe by Roman Church; move to Persia and onwards as far east as the Tarim Basin, now part of China's Xinjiang-Uygur Autonomous Region . 439 AD: The Northern Wei Dynasty (386 AD - 535 AD)(Tuoba Wei ; (拓跋魏) manage to unite all of Northern China under their rule. 442 AD: A Comet appears in the sky being followed for some 100 days. As it makes its pass through the solar system and along the sun it appears in the sky as a sword like star visible in opposition to the sun. A view along the Central Section of the Mogao Caves Ridge, south-east of Dunhuang, Western Gansu Province. The Mogao Caves are famous for their unique cave art, documenting the shift from Greco-Indian Buddhist art into destinctly Chinese forms more suitable to the local People and Cultures. Shandong Province to write his travel accounts and descriptions of the earliest practice of Buddhism along the Silk Road. Apart from his valuable travel logue, Fa Hsien is most known for his pilgrimage to Lumbini, the birthplace of Lord Buddha. In fact, it was only using Fa Hsien's accounts that late 19Th Century historians managed to pinpoint the exact location of Lumbini and the parental Home of Sakayamuni, The Buddha. 420 - 422 AD: a monk by the name of Tanhung arrived at Maijishan (麦积山石窟) near Tianshui and proceeded to build a small monastic community. Within a few years the Monastic Community came to thrive, only to abandon the Maijishan Cave Complex in the year 444 AD amidst a heavy bout of Buddhist Persecution sweeping the regions in that time. 420 AD: At the end of the Western Qing (西秦) Kingdom, one of the many nations of the so called 16 Kingdoms Period, first work on Buddhist Cave Art is started at the Bingling Buddhist Caves (Bingling Si ; 炳灵寺)(Today a remote site on the eastern rim of the Tibetan Plateau) near the Liujia Xia Reservoir of the Yellow River in Yongjing County, Linxia Hui Autonomous Prefecture in Gansu Province). As work continues through the Wei, Sui, Tang, Song, Yuan, Ming, and Qing Dynasty periods, altogether 183 Buddhist Caves and countless shrines and dieties are created situated on a high cliff face along the uppermost reaches of the Yellow River (Huang He) in China. 581 AD: Chinese regions reunite under the Sui Dynasty (581 AD - 618 AD) . The ancient Zhou, Qin and Han Dynasty Era Capital city of Chang'An (Today: Xi'An ) once more becomes the Capital City of China under the name of Daxing, while Luoyang (south of the Yellow River in todays northern Henan Province ) will serve as secondary Capital. By the year 609 AD, the Sui Dynasty has conquered large swaths south of the Yangtze River from Vietnam. A new founding and elongation of the Great Wall of China has fixed the so called Hexi Corridor (along the northern rim of the Tibetan plateau) under Chinese control, however heavy raids from neighboring Gokturks People (Tujue) who occupy much of northern Asia) are a recurring problem. 221 AD -265 AD : Period of the “Three Kingdoms;” China gets divided into rival dynasties. 226 AD : Chinese sources record a Roman trading party reaching China from India via a Sea-Route. Romans have managed to bypass both the Persian and the Indian sea-trade monopolies. 286 AD : Chinese sources record another Roman Trading Party reaching South China. After this visit Roman sea-power declines making direct contacts between the Roman Empire and China increasingly rare. Persian fleets take control of the Seas. 301 AD: Christianity became the State Religion in Armenia . 4th-5th Century: Greatest flow of Buddhism to China, during Northern Wei Dynasty (386 AD - 535 AD). 336 AD: Religious unrests disturb the ancient Kingdom of Armenia . In 337, just before the death of Constantine the Great (Reign: 324 AD - 337 AD) in Constantinople, Shapur II, provoked by the Roman rulers' backing of Roman Armenia, broke the peace concluded in 297 AD between the Persian (Sasanid) Emperor Narseh (293 - 302) and the Roman Emperor Diocletian (284 - 305), which had been observed for forty years. This was the beginning of two long drawn-out wars (337–350 and 358-363) between the Romans and Sasanians. 363 AD: Roman Forces once more penetrate deeply eastward into Mesopotamia on May 29 leading to The Great Battle of Ctesiphon (Today a ruined archeological site some 35 kilometers south-west of current day Baghdad), a face off between the Army of the Roman Emperor Julianus and his Sasanian counterpart Shapur II (also Saphur The Great). Although the Romans are victorious at Ctesiphon, only weeks later the Roman Emperor Julian is killed at the undecided Battle of Samarra. There after the Romans are unable to hold their grounds and are left stranded. They are eventually forced into a peace treaty and withdraw. 366 AD: The construction of the Mogao Caves (Mogao ku ; 莫高窟) , near Dunhuang at the very western end of the Hexi Corridor in Gansu Province , is generally taken to have begun sometime in the fourth century AD. According to a book written during the reign of Tang Empress Wu, Fokan Ji (佛龕記, An Account of Buddhist Shrines) by Li Junxiu (李君修), a Buddhist monk named Lè Zūn (樂尊, which may also be pronounced Yuezun) had a vision of a thousand Buddhas bathed in golden light at the site in 366 AD, inspiring him to build a cave here. The story is also found in other sources, such as in inscriptions on a stele in cave 332; an earlier date of 353 however was given in another document, Shazhou Tujing (沙州土鏡, Geography of Shazhou). He was later joined by a second monk Faliang (法良), and the site gradually grew, by the time of the Northern Liang a small community of monks had formed at the site. Members of the ruling family of Northern Wei and Northern Zhou constructed many caves here, and it flourished in the short-lived Sui Dynasty (581 AD - 618 AD) . By the Tang Dynasty Era (618 AD - 907 AD) - famous for its flourishing of Buddhism during certain reign periods, the number of caves had reached over a thousand. Much later, in the beginning of the 20th century the caves would become world famous, among things, as the location of the find of the worlds oldest printed book (The Diamond Sutra). 367 AD: Armenia was divided between Sasanian Persia and the Roman Empire. The Sasanid Empire established control in Eastern Armenia after the fall of the Arshakuni Armenian kingdom in 428 AD creating the State of Sasanid Armenia (or also Persian Armenia). 368 AD: The Xianbei, a Proto-Mongolian Peoples who have become populous and powerful roaming Mongolia, Inner Mongolia, and North and East China after the flight of Xiongnu (Huns) westward across the EurAsian continent and the subsequent fall of the Han Dynasty (206 BC - 221 AD) in China, found the so called Northern Wei Dynasty (368 AD - 534 AD)(also Tuoba Wei ; 拓跋魏 ; Later Wei or Yuan Wei) in North and North-Eastern China. At the time these regions are inhabited by nomadic and semi-nomadic peoples. In the course of their Dynasty the Tuoba Wei adopt Chinese cultural traits and among things acquire the religion of Buddhism which after some time appears in art styles and as the emergence of Buddhist Cave Complexes and Temples throughout north- and eastern China. 370 A.D. The Huns, a unified band of fleeing and wandering Nomadic Tribes driven westward arrive at the Volga River. 374 AD: a return visit of the object later named Halley's Comet takes it on an unusual trajectory which brings it within a mere 13 million kilometers distance to the sun. The resulting bright appearance and long tail is recorded at observatories in China but no such recording is made in the west (or this is later lost). As far as is known today this was the 2nd closest pass of Halley's Comet near the sun in recorded history. 453 A.D.: Death of Attila the Hun. 465 AD: First construction of what will be a large complex of Buddhist Caves starts at a sandstone cliff near Yungang Village outside of Pincheng, at the time the Capital of the Northern Wei Dynasty. 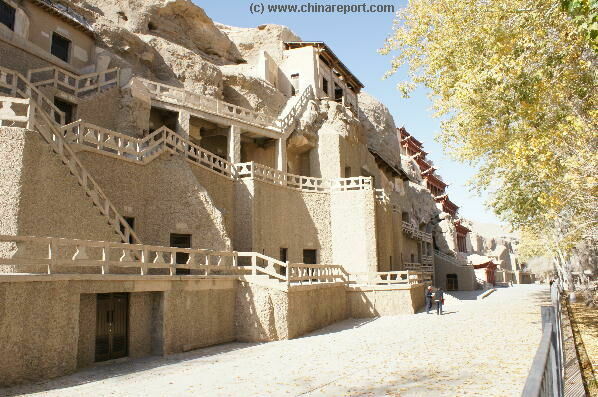 During the time that the city of Pincheng (平城)( Datong ) serves as the Capital of the Dynasty (471 AD - 494 AD), a complex of some 50 caves is carved out and adorned with Buddhist Deities and shrines. Additional shrines are added up to the year 525 AD after which all activity is seized. In the modern day world the Buddhist Religious Complex will become known as the Yungang Grottoes (云冈石窟 ; Yúngāng Shíkū; Wuzhoushan Grottoes) , one of the most noted and well visited cultural sites of the ancient Silk Road in China. 467 AD: Byzantine observers record the passing of a comet. The objects appearance is trumpet shaped and visible for some 40 days, according to Byzantine Chronicler Theophanes of Byzantium. Late 5th Century AD: First construction of a series of buildings on Sioni Street on the right bank of the Mtkvari River in Tiflis (Today: Tibilisi, Capital of Georgia) . The site would later become the location of the Sioni Cathedral of the Dormition (Georgian: სიონი (ტაძარი)) of Tbilisi, a National Monument which still stands today. Soon after, during the reign of Georgian King Vakhtang I Gorgasali of Iberia (Karti)(Reign: second half of the fifth century and the the first quarter of the sixth)(Life: Ca. 443 AD - 502 AD),probably during the laying of the foundations of the new Georgian capital Tiflis, a Christian Church was constructed on the site, giving rise to the first Church on the site destined to become the Sioni Cathedral of the Dormition. At the time the Church of Georgia was under the jurisdiction of the patriarch of Antioch. 534 AD: The second edition of the Justinian Law (Book) is published in Byzantium in the Eastern Roman Empire. Today it is the only surviving original text of fundamental works of Law jurispridence together known as the Corpus Juris Civilis i.e. Justinian Law in modern times. 537 AD: In Byzantium (current day Istanbul) the Yasofia (Greek: Αγία Σοφία ; "Holy Wisdom"; Latin: Sancta Sophia or Sancta Sapientia; Turkish: Ayasofya)(Today: Hagia Sophia Mosque museum) Church rises. Until the fall of Byzantium it will be the first Church of the (Eastern) Roman Empire and the seat of of the Patriarch of Constantinople. 540 AD : Rise of a Wall of Anushirvan, built on orders of the Persian King Anushirvan the Just (Chosroes I (Kasra) of Persia - انوشیروان عادل , Reign: 531 AD - 579 AD). The wall reaches from western beach of the Caspian Sea to the City of Anushirvan and from there across the ridge of the Caucasus in order to dominate cross-border Trade. It became known as the Iron Gate (Mongolian: Timur Qapu). Parts remain today. 552 AD : Nestorian Monks succeed in smuggling out Silk Worms from the Chinese Empire. After a perilous journey the Monks present the Silk Worms and spied technology to Justinian, Emperor of the Eastern Roman Empire based in Constantinople (also Byzantium)(current day Istanbul). Delighted the Emperor orders the creation of Royal Silk Farms and silk weaving factories. This is the first Time the Chinese Monopoly on Silk Cultivation and production technologies has been broken. Chinese Silks remain however the highest in quality and Silk Road Trade continues uninterrupted. 581 AD: The Türk Khaganate implodes and after a series of internal wars splits into two halfs; The Eastern and the Western Turkic Khaganates (Dong Tujue and Xi Tujue). While military pressure on surrounding Nations dwindles, in the interval, that same year the Sui Dynasty (581 AD - 618 AD) is founded in China. 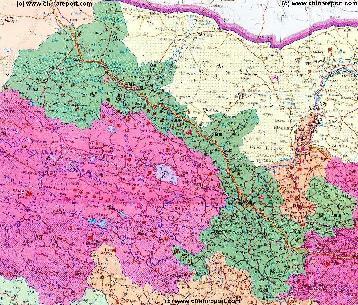 A Geographic overview Map of Gansu Province entire delineating provincial borders and parts of neighboring Xinjiang-Uygur Autonomous Region Province and Qinghai Province in the West, Inner Mongolia AR and Ningxia Province in the North, Shaanxi Province to the East and Sichuan Province in the South. Includes Cities and Towns (shown by size), Main Monuments & Landmarks of Gansu Province, the flow of the yellow river through Sichuan, Qinghai, Gansu and Ningxia Provinces, BingLing Si, Maiji Shan and Mogao Caves UNESCO World Heritage Sites, Main Mountains (with Height), major highways, provincial railroads and main railroad-stations, and main waterways & rivers. This Map further provides links to on site photos and information on the Cities and Main Monuments Other sites will be included in the Future. 384 AD - 417 AD : During the "Later Qin" (Dynasty) Era (384 AD - 417 AD), probably after the establishment of the Kingdom of Northern Liang (北涼) in 397 AD work begins on a Buddhist Cave and Temple Complex at "Wheatstack Mountain" (麦积山) near Tianshui, in the Wei River Valley (current day Gansu Province). It is the beginning of the Silk Road wonder of the Maijishan Grottoes (Chinese: 麦积山石窟 ; Màijīshān Shíkū). Around 390 AD: At some time during the early years of the rule of the Northern Wei Dynasty (Tuuoba Wei ; )(386 AD - 534 AD), in what today are the southern regions of Ningxia Hui Autonomous Region of China (P.R.C. ), the first cave for Buddhist worship is cut near the Sikouzi River (Historically: Stone Gate River) at Mount Xumishan. The complex, which will be renovated and expanded during the following Western Wei (535 AD - 557 AD), Northern Zhou (557 AD - 581 AD), Sui (581 AD - 618 AD), and the Tang Dynasty (618 AD - 907 AD), will go on to become the largest Buddhist Temple Site in the wider regions, altogether featuring some 8 stone carved cliffs which are separated from eachother by narrow ravines. 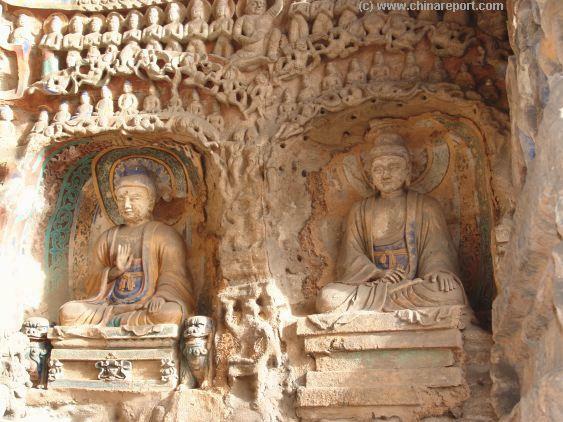 Today, the resulting mount Xumishan Buddhist Caves (Xumishan Grottoes ; Chinese: 须弥山石窟) are ranked among the top 10 of most noted such Buddhist Cave complexes along the Silk Road of ancient China. 390 AD: A Great Comet appears in the sky its light and size growing to staggering proportions as the celestial object closes on both sun and planet earth. Eye witnesses in China report a comet tale covering a full 100 degrees of the sky in daylight, while the massive object appeared brighter than the planet Venus in sky. In Ancient Greece, the historian Philostorgios recorded its passing describing it as only slightly less bright than Venus while taking the shape of a sword. His contemporary Roman Ammanius Marcellinus described the sight as a pillar in the sky, which according to him was visible for 30 days. The 390 AD Comet was likely a sun grazing comet which upon its approach to the sun came to within a distance of 14 million kilometers (0.1 AU) of the earth (compared to 1 Astronomical Unit (A.U. )= the (rough) distance earth to sun = about 150 million kilometers, or 93 million miles). Nearly impacting the earth, the amazing comet streaked past then disappeared out of sight. 397 AD: Chinese chronicle Taï-thsing-i-tung-tshi reports Khotan flourishing as a trade center. 397 AD - 439 AD: At some time during the brief existence of the Kingdom of Northern Liang (北涼)(or possibly slightly earlier during the Eastern Jin (晉) Dynasty (265 AD - 420 AD), one of the 16 Kingdoms of the 16 Kingdoms Period in Chinese history, near Zhangye in the Hexi Corridor, work is started at the Jinta Cave of what will become known as the Horse Hoof Temple (Ma Ti Si) Buddhist cave complex (Today in Sunan Yugur Autonomous County of Zhangye (City) Prefecture in the Hexi Corridor of western Gansu Province). During the Liang Period and in the following Northern Wei Dynasty (386 AD - 535 AD), Sui Dynasty (581 AD - 618 AD), Tang Dynasty (618 - 907 AD), the Tangut Empire (Xixia Dynasty ; Chinese: 西夏) (1038 AD - 1227 AD) and following Yuan Dynasty (1271 - 1368 AD), some 7 groups of Buddhist caves will appear in a valley (area) of some 30 kilometers in length. 400 A.D.: An amazing comet, reportedly larger than any seen before lights up the skies above planet earth. It causes a great stirring among humanity as its closes on the planet to (likely) within 10 million kilometers of earth (some 0.07 Astronomical Units). Escaping a full impact of this Comet planet earth and humanity survive as the object disappears into the far corners of space. Early 5th Century AD. Work starts at the Bezeklik Buddhist Cave complex (Chinese: 柏孜克里千佛洞 ; Bózīkèlǐ Qiānfódòng) near the Oasis of Turpan along the central northern route of the Silk Road in "Chinese Turkestan" (Today: Xinjiang). Activity and construction at the complex will go on until the 14th century during the Western Uyghur Kingdom. From the early 3rd century AD, work on the caves will continue through to the 8th century AD. Plains and Caucasus Region to attack the Roman earstern borders. In a momentous battle in the Catalanian Plains not far from Rome the armies of Attila the Hun are finally stopped. Between 380 - 391 AD: In Rome, t‍‍he historian Ammianus Marcellinus (Life: c. 330 - c. 400) wrote that the land of the Seres (I.e. Silk producing people, as we now know the Chinese) was enclosed by great natural walls around a river called Bautis, possibly a description of the Yellow River (Huang He). 420 AD: Yazdegerd I (Middle Persian: 𐭩𐭦𐭣𐭪𐭥𐭲𐭩‎ Yazdekert, meaning "made by God"; New Persian: یزدگرد Yazdegerd)(Life: unknown - 21 January, 420 AD), 12th King (Shah) of the Sasanian Empire, dies after a 21-year reign at a location in the Gurgan (Hyrcania ; Greek: Ὑρκανία Hyrkania, Old Persian: Varkâna, Middle Persian: Gurgān, Akkadian: Urqananu)(Historical region)) in Iran. After a brief interlude under a usurper King (Khosrau (Middle Persian: 𐭧𐭥𐭮𐭫𐭥𐭣𐭩‎), better known as Khosrau the Usurper, a Sasanian pretender), he is succeeded by his son Bahram V ((Middle Persian: 𐭥𐭫𐭧𐭫𐭠𐭭‎ Wahrām), also known as Bahram Gor (Persian: بهرام گور‎, "Bahram the onager")), who becomes head of the Sasanid Persian Empire. 420 ‍‍AD: Abdas, bishop of Susa (Persian: شوش‬‎ Šuš; [ʃuʃ]; Hebrew: שׁוּשָׁן‬ Šušān; Greek: Σοῦσα [ˈsuːsa]; Syriac: ܫܘܫ‎ Šuš; Old Persian Çūšā)(a historical city in current day Iran), is accused of burning down one of the fire temples of Ahura Mazda (Zoroastrian Temple; Ohrmazd, Ahuramazda, Hourmazd, Hormazd, Harzoo and Hurmuz is the name of the sole God of this ancient Persian religion). 283 AD : the Temple of Saturn ‍(‍‍in it's 2nd form as created in 42 BC) at the "Forum Romanum" in Rome is devastated by Fire (dubbed the "Fire of Carinus" after the Roman Emperor Carinus (Latin: Marcus Aurelius Carinus Augustus)(Reign: 283 AD - 285 AD) who took power in that year). The currently still existent 6 columns in grey granite on the front, the 2 in red granite on the sides and the pediment, consisting primarily of recycled blocks, date to this period. August 1, 6‍‍08 AD: T‍‍he undecorated column‍‍ in honour of the Byzantine Emperor Phocas (Latin: Flavius Phocas Augustus; Greek: Φωκᾶς, Phokas)(Reign: 23 November 602 AD -‍‍ 5 October 610 AD) becomes the last historical structure to be erected at the Forum Romanum, for well over a thousand years the political heart and center of the city of Rome. After that, the structures of the Forum Romanum began to decay. 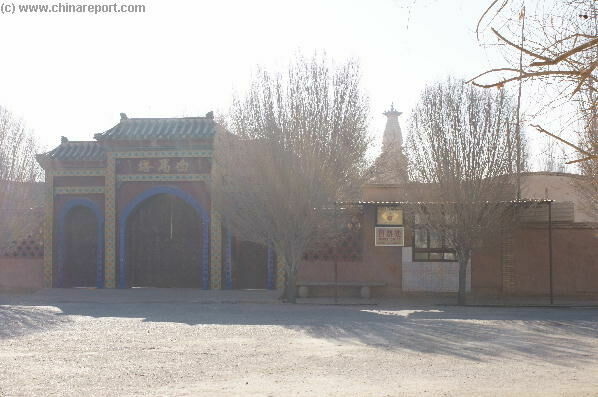 A view of the front of the white horse temple in Danghe Township of Dunhuang in November of 2007. Behind the main gate the 12 meter high stupa (last repaired in 1992) can be clearly seen. on the burial site of the horse. Notably, later, in the year 401 AD, the third year of the reign period of Yáo Xīng (姚興) as the Hongshi ( 弘始) Emperor (399 AD - 416 AD) of the later Qin Dynasty (simplified Chinese: 后秦; traditional Chinese: 後秦; pinyin: Hòuqín)(‍3‍‍84 AD - 417 AD), Kumārajīva‍ traveled on to the Chinese Capital of Chang'An, where it is said he translated a total of 384 volumes of 74 Buddhist scriptures in a work shared with some 800 other people including his brother. Thus he introduced to China the idealistic theory of the Kongzong Sect of Mahayana Buddhism in a systematic way. Ever since, Kumārajīva‍ has been commemorated as one of the earliest purveyors of Buddhist knowledge between India, Central Asia and the Chinese heartlands . Today, well over 1600 years after the dying of the loyal horse of Kumārajīva‍ at Dunhuang, both horse and teachers are still commemorated by the white horse stupa, around which has been built a small Temple both of which still exist today as one of the historical and cultural landmarks of the (County-Level) city of Dunhuang, ancient Oasis Town of the silk road. Today's stupa is built in the style of the Ming Dynasty (1368 AD - 1644 AD), standing some 12 meters high‍ ‍‍( 39.4 feet ) and consisting of 9 layers (tiers). At some time in the late 4th Century BC or the beginning of the 5th century BC during the rule of the Kushan Empire, the world saw the construction of the mysterious Stupa and Monastery complex of Takht-i-rustam (or Takht-e Rostam aslo known as the Stupa of Takht-e Rostam). Today the remnants of this site can still be found at some 2 kilometres south of the town of Haibak (or Aibak) in the Samangan (Persian: سمنگان‎) Province near the Hindu Kush Mountains in northern Afghanistan. Although the true purpose of this site has been lost to human memory, it is believed that it was an important Buddhist Monastery situated along the path of the Silk Road between the birthplace of the Buddha in (north) India and Central Asia. Historicity of the Samangan town dates to the time of the Kushan Empire (30 AD - 375 AD) during the 4th and 5th centuries when it was a famous Buddhist centre. renovation of the Hippodrome. While the persecution of Christians was stopped, the figures of old gods were either replaced or assimilated into a framework of Christian symbolism. The new city was protected by the relics of the True Cross, the Rod of Moses and other holy relics. 525 AD: Unrest in the wider regions ends the construction of the Buddhist cave complexes of Yungang ( Yungang Grottoes, formerly the Wuzhoushan Grottoes ), near current day Datong ( 大同市 ), northern Shanxi Province, China (P.R.C). In total, after completion, the Buddhist cave complex counts some 53 major caves, 1100 minor caves and 51,000 niches housing the same number of Buddha statues. In the year 2001, at the 25th session of the UN heritage committee the site is made a UNESCO world cultural heritage site. 536 AD: Marks the beginning of what has been called "the most disastrous decade in human history". As has since been scientifically proven from ice core samples taken at the Colle Gnifetti Glacier in the Swiss Alps and tree ring studies, a massive volcanic eruption, likely in northern America or Greenland, causes the skies above Europe and the northern hemisphere to be clouded with a thin layer of volcanic ashes. The mysterious fog plunged Europe, the Middle East, and parts of Asia into darkness, day and night - for 18 months. "For the sun gave forth its light without brightness, like the moon, during the whole year," wrote Byzantine historian Procopius. Temperatures in the summer of 536 fell 1.5°C to 2.5°C, initiating the coldest decade in the past 2300 years. Snow fell that summer in China; crops failed; people starved. Tow more massive volcanic eruption, one in the year 540 AD and another in 547 AD prolonged the period of cold, as they continued to black out the sky and by reflecting solar light back into space cooled the earths temperature considerably. The year 540 was again unusually cold (Temperature drop: 1.4°C - 2.7°C in Europe). 541 AD: Bubonic plague struck the Roman port of Pelusium, in Egypt (Source: Byzantine historian Procopius). In the following 2 years, the pandemic quickly spreads through the Eastern Roman (Byzantine) Empire, especially its capital Constantinople, the Sasanian Empire, and port cities around the entire Mediterranean Sea becoming one of the deadliest plague's in human history. What came to be called the Justinian Plague, after the Byzantine Emperor of the time of the first outbreak, spread rapidly, wiping out one-third to one-half of the population of the eastern Roman Empire and hastening its collapse. The pandemic resulted in the deaths of an estimated 25 to 50 million people in two centuries of recurrence, equivalent to 13 to 26% of the world's population at the time of the first outbreak. As a result agricultural productivity sagged while general economic activity in the west of the Eurasian continent ground to a halt remaining low for many decades. In more modern times ancient and modern Yersinia pestis strains closely related to the ancestor of the Justinian plague strain have been found in Tian Shan (heavenly Mountains), a system of mountain ranges on the borders of Kyrgyzstan, Kazakhstan, and China (P.R.C. ), suggesting that the Justinian plague may have originated in or near that region and had been carried westward from that region along the trading pathways of the Silk Road or that the expansion of nomadic peoples who moved across the Eurasian steppe, such as the Xiongnu and the later Huns, had a role in spreading plague to West Eurasia from an origin in Central Asia. Today the Justinian Plague is remembered as the first epidemic of the bubonic plague (caused by Yersinia Pestis) in human history. 581 AD: Reopening of the Hagia Sophia Church after the collapse of its dome in the year 558. Following the collapse which crushed the high altar, the dome had been reconstructed on a slightly smaller scale then the previous. Between May 20 and May 29, 526 AD: Around the time of the celebrations for Ascension Day, when the city was packed with visitors from surrounding area's, a Major earthquake strikes Antioch (on the Orontes River) and surrounding parts of the Syria Region. The earthquake occurred at mid-morning, killing approximately 250,000 people. The earthquake was followed by a fire that destroyed most of the buildings left standing by the earthquake. The maximum intensity in Antioch is estimated to be between VIII (Severe) and IX (Violent) on the Mercalli intensity scale. The estimated magnitude for the earthquake is 7.0 on the surface wave magnitude scale. The earthquake caused severe damage to many of the buildings in Antioch, including Constantine's great octagonal church Domus Aurea built on an island in the Orontes River. Only houses built close to the mountain are said to have survived. Most of the damage however, was a result of the fires that went on for many days in the immediate aftermath of the earthquake, made worse by the wind. The Great Church was destroyed by the fire seven days after the earthquake. Amongst the many victims was Euphrasius the Patriarch of Antioch, who died by falling into a cauldron of pitch being used by wineskin makers, with only his head remaining unburnt. In the nearby port of Seleucia Pieria an uplift of the ground level of 0.7 - 0.8 meters has been estimated, and the subsequent silting up of the harbour left it unusable. November 528 AD: Another heavy earthquake strikes the Byzantine city of Antioch on the Orontes. The Great Church and many other buildings, the reconstruction of which had been overseen by Ephraim (also Saint Ephraim of Antioch (Greek: Άγιος Εφραίμ ο Αντιοχείας)), the comes Orientis and since 527 Patriarch of Antioch, were once more destroyed. Some 5000 people were killed.